Where: Stratton Hall, 3146 Broad St.
Porcelain pieces will be sold at the Houston Show by Len Harmon Antiques of North Carolina and Dan Marquette Dogwood Antiques from Indiana. Seventeen vendors from across the Southeast are bringing vintage treasures to Stratton Hall, the new event venue on Broad Street, in preparation for this weekend's 39th annual Houston Museum Antiques Show & Sale. To meet the demand for estate jewelry, which has proven a consistent trend at the Houston show, about one-third of these vendors will display antique jewelry and costume jewelry, says Donna Kidd of Charleston, S.C., the show coordinator. The majority of the inventory will consist of collectibles and "smalls" such as porcelain, art glass, rugs, antique linens, 18th- and 19th-century oils, silverware and vintage books. However, Jerry Stinnett of Lynchburg, Va., owner of Status Symbol Antiques, will show English furniture. "This is a small show but a very fine show," Kidd says. "Donna is a pro when it comes to managing antiques events," said Houston board member Marilyn Hoke in a news release from the museum. "Shoppers can buy with an assurance of complete authenticity. 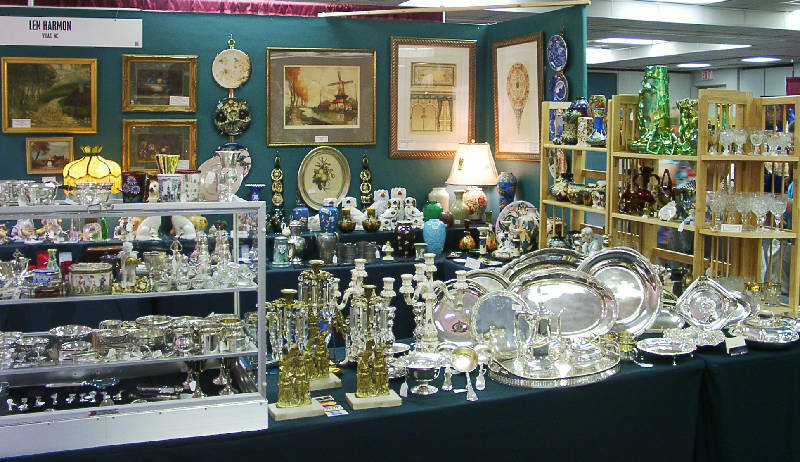 Our dealers are willing to share their knowledge about antiques -- that's one of the most fun aspects of the show." Steven Martin, with Sonny Ideker Bookseller of Atlanta, says Ideker specializes in rare leather and velum bindings. "Some of our really special old books date from 1426 and forward," says Martin. "We have a lot from the 19th century -- Dickens, Poe, Bronte, Austen." Martin says 19th-century fiction is a best-seller at shows currently, but many folks are purchasing vintage books to display their elegant bindings in their libraries. He said rare books can start "as low as $25" for some of the early children's books. Vendor Carol Thacker of Adairville, Ky., said she will have an eclectic mix of antique linens, quilts, Victorian jewelry and old ironstone with her. Her daughter will share the booth, displaying vintage clothing from the 1940s. "People collect linens, but others are using old linens that may have been stored away that they worked so hard on but never used," says Thacker. Kathie Fulghum, Houston show chairwoman, says there will not be an appraisal fair this year. Instead, the show is hosting informal talks over the three days by Bill Carney, founder and director of Chattanooga Woodworking Academy. He will talk about restoring antiques as well as be available to answer questions from guests. This antiques show and sale is the Houston Museum's biggest fundraiser of the year, says Fulghum. Proceeds help fund operational expenses of the museum in the Bluff View Art District. It houses what is considered one of the finest collections of glass and ceramics in the country.